Two of each meal arrived neatly packaged in good condition. They are well sealed with an easy to rip open top and resealable closure below. The packets are approximately 8 x 6.5 in (20 x 16.5 cm) and fairly flat. They look like they should be easy to pack. The ingredients as noted on the package are ones I can pronounce. They sound tasty and nutritious like something I would possibly prepare for dinner at home. I really like the use of whole foods without the preservatives or other "industrial foodstuff". The nutritional facts are appealing to me as well. The daily value percentages are pretty good. They are a bit higher in sodium than we cook home. However if I account for the sweat factor during activity the extra salt might be needed. The stew helps strike a health balance. It serves up the fiber at 40% daily value, they're definitely using real kale! When it comes to meals for hiking I always look at the calories. I definitely eat more than 2000 calories when hiking. At 330 for the chowdah and 360 for the stew I will need to pair these with other foods. Oh the spelling, this is a New England made chowder and in this neck of the woods they say "chow-dah". I like that Good To-Go has a sense of humor and pays vernacular homage to their locale. 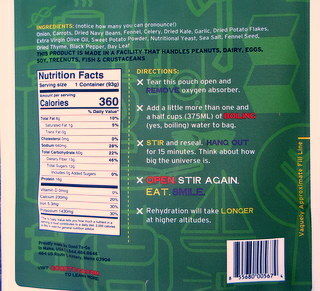 Cooking instructions are as simple as the ingredients. 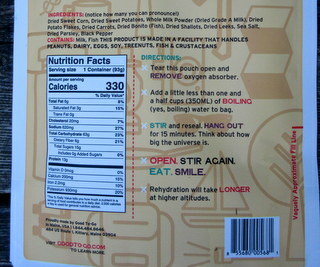 The following are the paraphrased directions for on the back of each package. - Add boiling water (amounts differ for stew and chowdah) to bag. The boiling part is stressed. The chowdah calls for a little less than 1.5 cups (350 ml). The stew calls for a little more than 1.5 cups (375 ml). I have not tried these meals yet. Rather i will wait till I am out on a backpack. I imagine rehydration times might vary between at home and outdoor cooking. Additionally, a day of hiking and dining al fresco may enhance or dampen my perception of flavor and taste. While I have not had either of these specific meals from Good To-Go I have eaten several others. The ones I have tried were satisfying. Additionally my past experience had been in warmer months. 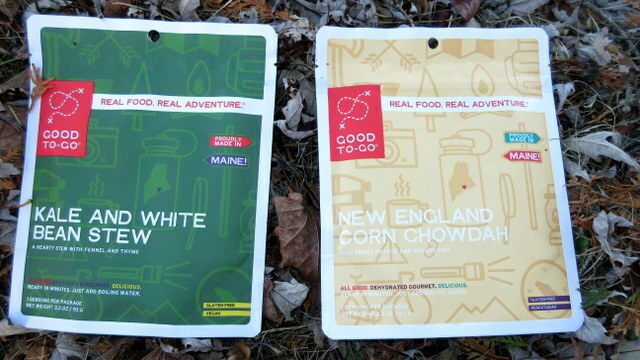 This will be my first time making Good To-Go meals in the colder winter months. I'm a fan of a hearty stew or chowder especially in the winter. Both of these meals sound flavorful while providing wholesome nutrition. I like the use of the basic, whole food ingredients in an easy just add boiling water cooking method. I am looking forward to my outdoor dining experience with these meals. My first experience with the meals was on a day hike to Mt. Cardigan. I had trouble deciding which to pack for my lunch. I ended up scrambling the packages on the counter with eyes closed then reaching for one. It ending up being the Chowdah. The goal of this hike was to climb the steep and snowy Holt Trail. The last section is very steep with some hand over head climbing. Then after treeline I encountered steep hard snow, ice and deep drifts. I factored in time in case I had to turn around and take a different trail. I was happy with the successful climb but tired and hungry from the extra exertion. On the way down I searched for a sheltered spot off the trail to boil water for lunch. While waiting for water to boil I quickly chilled. After pouring in the hot water and stirring I was very happy to see the seal on the pouch closed tightly. I was able to put the meal pouch inside my jacket against my baselayer. This help to bring my core temp back up and keep the pouch insulated while rehydrating. The 15 minute wait seems like a long time when hungry and outside in the cold. However it did allow time to drink hot tea, break down the stove and have my first course of peanut butter and jelly sandwich. Then it was Chowdah time. Opening the pouch the smoky rich aroma rushed me and I dug in. The Chowdah was hot, rich and mildly sweet. There was a lot going on with chunks of carrot, sweet potato, leeks and corn. Then there's a smoky after note. I finished the whole thing before it fully cooled. I was warm, full and pleased. Next hike was for one night out on Mt. Cube. This time I took the Stew and a bag full of cheese and crackers. I ate half of the cheese and crackers while waiting the 15 minute rehydrate time. Then it was time for what ended up being a thick, rich, hot stew. It was colorful with nice chunks of veggies and the spices provided good aroma and flavor. The best I can describe it is "earthy" in a good nourishing way. I scraped out every last bit and titled the pouch to get every last drop of fluid. I finished off the remaining cheese and crackers for well paired and satisfying meal. My final outing with the Good To-Go Meals was on a three day introduction to mountaineering course. After setting up my hidden bivy near a trailhead I ventured into town for my first dinner. The second night found us farther from civilization so I cooked up the last two meals. This would be the head to head Chowdah versus Stew dinner party. 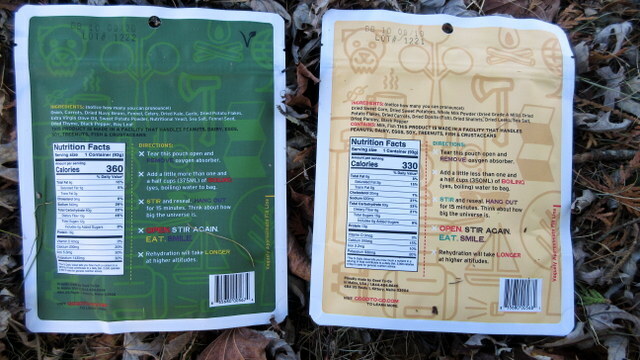 This time after sealing the pouches I closed them both in a plastic bag and put them in my sleeping bag for the 15 minute rehydrate. I boiled water for the night and next morning and ate my oatmeal raisin cookie appetizer. Then I dug into a dual soup dinner. They were dueling then complementary taste. The Chowdah is sweeter and creamier than the stew. The stew is thicker and more complex than the Chowdah. The two oddly balanced each other and I was surprisingly satisfied with the combination. After cleaning up dinner I had a chocolate chip cookie for desert. 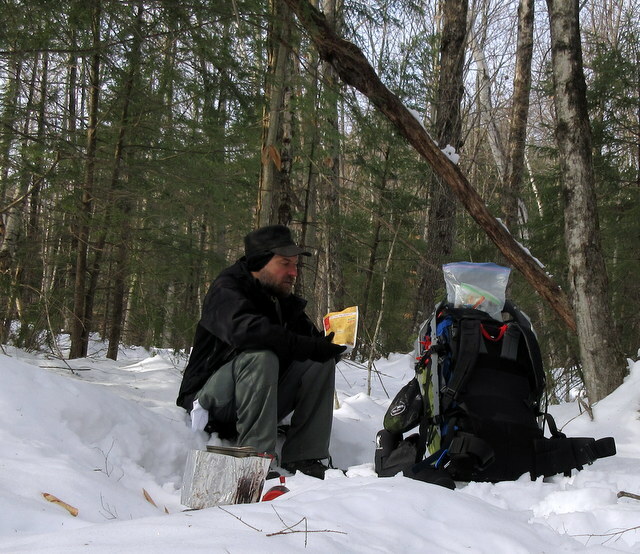 Hot fluids, sugar and fat help keep a winter camper warm! Both the Chowdah and Stew were tasty and satisfying. They rehydrate nicely, were easy and pleasurable to eat while warming my belly on cold days. I really like the nutritious energy supplied from real and wholesome ingredients. When paired with a sandwich or a fair amount of cheese and crackers the soups satisfied my hunger. Also when eating two single servings my appetite was satisfied. While I enjoyed them both if I had to choose the Stew edges out the Chowdah. Good To-Go Meals does right by me again, I have never eaten one I did not like. I will certainly be eating the Stew and Chowdah on future backpacks. This brings my Long-Term Report to its end. I would like to extend my appreciation to Good To-Go Meals and BackpackGearTest.org for making this test series possible.